The Chevrolet Nomad series station wagons built from 1955 to 1957 are highly desirable cars to collect or restore. Don’t look for any bargains however. Prices can range from 20,000 to 42,000 and even higher depending on the model. Six cylinder versions go for less. The 1957 version is the most desirable in the current market. Finding any Nomad in restorable condition can be a worthwhile project for the car enthusiast however. Most of the parts used on these models came from the passenger cars. The Nomad is arguably the prettiest station wagon ever built. Oddly enough the idea came from a Corvette show car, which was on display at a car show at the Waldorf Astoria in New York. Under the direction of design chief Harley Earl, Chevrolet had introduced the Corvette, GM’s legendary fiberglass sports car to the public in 1953. In 1953 Earl had a station wagon show car version of the Corvette called the Corvette Nomad built for the 1954 Motorama at the Waldorf Astoria in New York. This station wagon version of the Corvette had a stylish roofline. The roof design had been conceived by stylist Carl Renner. It never went into production but it was quite popular at the show. 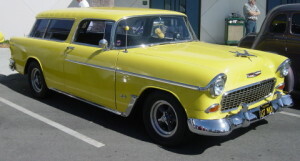 After the popularity of the show car, GM executives instructed Renner to modify the design to incorporate some of its styling cues into its 1955 station wagon lineup. Renner revised his drawings to stretch the design to fit on the wagons. The result was the 1955 Chevrolet Bel Air Nomad. It was a sporty station wagon with hardtop styling unlike anything that had been produced before. Nomads look fast even when they are parked. Nomads only came in two door models although there is plenty of hauling space in the rear. Total production was only about 23,000 units so plan on looking hard for one. These units were not popular at the time because of the two-door only configuration and the cost, which was typically higher than the convertible. There were leaking problems with the tailgate also because of alignment problems. Chevrolet manufactured a new lightweight small block V8 for 1955 and they put it in the Nomad also. The old “stovebolt” six was also available. 1956 saw GM add a dual four-barrel option for the V8 and in 1957 they offered fuel injection. Transmissions included Chevrolet’s trusty 2-speed Powerglide, a manual three on the column and a new smooth shifting automatic offered in 1957 called Turboglide. The body style was the same except for styling tweaks, which paralleled the passenger line. The Nomad had sloping “b” pillars, a rakish tailgate, hardtop styling and a fluted roof consisting of nine transverse groves on the roof. They all had the signature seven chrome strips on the tailgate known as the “bananas.” Each year fronts and rears were restyled with new grilles and taillights and side moldings were also modified. The 1957 version had the big fins and like its passenger counterpart is considered by many to be the prettiest of the series but that is debatable. As stated, the 1955-1957 Chevrolet Nomad station wagons may be the prettiest station wagons built according to popular consensus. It is a great car to own for its beauty and it’s quite functional too. If you’re not into buying one quite yet, look for one at your local car show.